A Bible concordance will help you really understand EACH word, which will enrich your experience AND help you understand the truth.The Bible was written in two languages, Hebrew and Greek. The Old Testament is in Hebrew and the New Testament was written in Greek. This is why there are so many versions of the Bible because it’s been translated. ​* KJV who wanted to divorce his wife, so it leans in that direction. ​If you read RYM then you saw in Chapter 11 why learning to look up words in the original language was important. Pastors were telling me that I should divorce my husband due to adultery. Believing these pastors were bible scholars, they tried to convince me to do what I had a moral right to do. ​Again, very few divorces in the church are for the reason of adultery, even if that were the correct “exception.” When Erin was told that she had grounds for divorce because I was in adultery, she sought to find out the truth. What she found was that is many Bible translations the words “adultery” and “fornication” or “moral impurities” were used interchangeably as though they were the same words – but she found they are not the same words! The word “adultery” (Strong’s Concordance in the Greek or original language is 3429 Moichao) that means an act of intimacy after marriage. 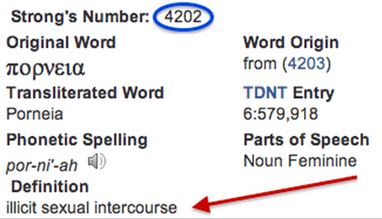 But the word “fornication” (4202) means an act of intimacy before marriage. Therefore these are two separate sins and should not be confused. 1. Click and bookmark the site. 4. Since the word in question is immorality, then if you hover over the word, you’ll see immorality (below) is 4202 to click on. * Again, this is a KJV definition, so it has that lean when it says “conjugal” that is defined as between a husband and a wife. The king wanted to divorce his wife, so he had an English translation. Here is a very short history lesson on the history of the KJV. ​7. To dig for the truth is the only way to combat the lies that the enemy will try to use to stop your Restoration Journey. The only way to make it through, is to use a map and compass and decipher the clues hidden along the way: Trust, seek and listen.